A shot of Irish whiskey with a wee wedge of lime. Photo courtesy Jameson. This glossary is a companion piece to our overview article about whiskey, Whiskey 101. Please contact us if you’d like to suggest additional terms. The Whiskey Glossary is just one of many NIBBLE Food Glossaries. Take a look at the entire collection. This glossary is copyrighted and cannot be reproduced without written permission. An old name given to an taxman whose job was to assist in the prevention of illicit distillation, notably poteen in Ireland. Whiskey produced from column stills, normally made from wheat or maize with a small quantity of malted barley to aid fermentation. The grain is aged for several years—the grains used in Johnny Walker Red, for example, are aged from four and six years. Malt is aged as well. The crushed grain mixture of malted and unmalted barley, used in the making of Irish pot still whiskey. The “heart” of the spirit is the best part of the distillation—the purest and most flavorful middle third of the distillation stream. The first and last thirds, known as the “head” and “tail” respectively, are retained in inferior brands and redistilled to improve their quality somewhat. With premier distilleries, the heads and tails are turned into bio-gas (car fueled). Liquor that is illicitly distilled and distributed. See moonshine. A distillate from India. It isn’t whiskey per se, but more of a rum-like spirit, since much Indian whiskey is distilled from fermented molasses. However, India has begun to distil whiskey from malt and other grains. If you purchase such a product, be sure to read the label or ask, to know what you are buying. Irish whiskey is triple-distilled for extra smoothness and aged for a minimum of four years. It is often suggested that beginners start with Irish whiskey as a first step in whiskey drinking, because it is so light and smooth (one may be happy to stay there, especially if one does not like smoky flavors). 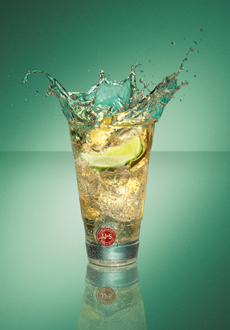 Finesse is the word: Its mellow yet flavorful character made it the world’s favorite whiskey in the late Victorian era. The use of unmalted barley in the production of Irish whiskey offers a very different flavor profile from Scotches—no smokiness but a perfumed, slightly sweet character. Although Scotch has dominated the whiskey scene for a long time, Irish whiskey is finally beginning to gain the recognition it deserves. 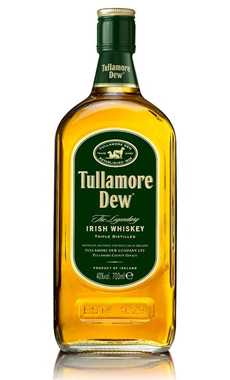 A few popular brands of Irish whiskey include Bushmill’s, Connemara, Jameson and Tullamore Dew. A whiskey producer or distiller. The process of mixing whiskeys from more than one distillery in order to form a blend or vatting (blended whiskey or vatted malt Scotch, e.g.). In the process of creating beer and spirits, malted grain is mixed with hot water and steeped at various temperatures to allow enzymes in the malt to break down the starch in the grain into sugars. The mixture is called the mash; after the starches in the grain have been enzymatically broken down into sugars, it is called the wort. A large container holding grist and hot water for mashing process. The product of the mash tun is known as wort. 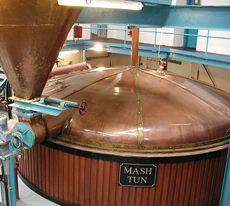 A mash tun. Photo courtesy Bowmore Distillery. The process of creating the mash. This is a complex, slow heating process that takes place in a large, closed kettle or mash tun. The process of aging whiskey in casks over a period of years, where it reacts with the wood and takes on more complex flavors. The longer whiskey is left to mature, the greater complexity it will gain from the chemicals within the wood (hence, 12-year-old, 25-year-old, etc.). Scotch is often aged in used Bourbon barrels. Illicitly distilled liquor, especially the clear, unaged corn whiskey that was popular in rural areas of the southern U.S. Moonshine was an illegal product: The “moonshiners” who made it not only avoided paying state and federal taxes on their hooch, but they had no license to produce it in the first place. It got the name “moonshine” because the work was done in the wee hours, under the light of the moon and out of the eyes of the law. Today, artisan corn whiskey called moonshine—legally made—can be found. 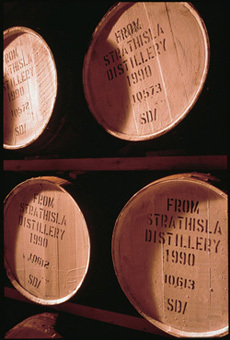 Whiskey aging in wooden casks. Photo courtesy Chivas.